When something goes wrong around the house, a large percentage of these problems can be fixed with the services of a plumber. A leaky faucet, a blocked toilet, a shower that doesn’t drain properly…all of these issues require plumbing. Whether it be an emergency plumber to come to any area of Melbourne immediately or just a reputable company to fix a pipe within a few days, the below businesses are reputable, affordable and reliable. Red Dog Plumbing is based in Williamstown but services areas throughout the Western suburbs. They can do emergency call out around the clock and assist with plumbing, toilet repairs, dishwashers, blocked drains, broken hot water systems, dripping taps, bathroom renovations and more. Steve and his team have over 20 years experience and have provided work for some of Australia’s largest construction companies. Another speciality of these plumbers are fixing roofs which can be a massive headache to homeowners when problems arise. With specialised equipment, they can ensure leak detection is made fast and accurately so they can stop the problem at the source. Clearing out of guttering and down-pipes can act as a preventative measure too, reducing the likelihood of further issues arising in the future. Zero Plumbing is a professional company run by David Pearson, an expert plumber with a wealth of industry experience. He is knowledgable, reliable and friendly, so it’s no surprise that his whole team has similar qualities. Located in Burwood, Zero services most of the inner eastern suburbs of Melbourne and can perform general plumbing tasks for home owners such as blocked drains, hot water services, roofing, leak detection and renovations/extensions. They also commercial plumbing for business as well as ongoing contracts for body corporates. 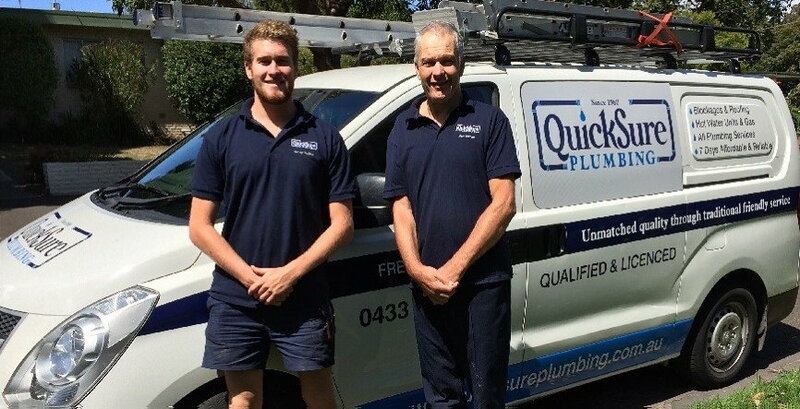 QuickSure is a family owned plumbing business which has now moved to Ocean Grove, about 90 minutes out of Melbourne. They still have a truck providing work in Camberwell, but the team now focuses on providing services throught the Bellarine Peninsula including Point Lonsdale, Queenscliff and Ocean Grove. As well as plumber services and blocked drains, they also offer hot water unit repair and installation, carbon monoxide testing, shower leak detection and repair and other tasks. Highly reputable with 35 years of experience and available 7 days a week.